DJ Marc Fournier lives to play music for people. Playing his first gig at aged sixteen in Kibuye (Rwanda), he has never looked back. 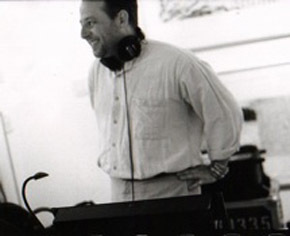 Marc has since delivered global beats and soulful vibes on boats on the France-Ireland crossing, trains in the Piedmont in Italy, bars, restaraunts and clubs. With a knowledge and a passion for Latin, Brazilian, African, Middle Eastern, Flamenco, Electronica, Ska, Reggae and Film Music... Marc's love for cultural collisions, experiements and meetings through music is obvious when he performs live, often with a percussionist. Marc has opened for well respected artists such as Los Amigos Invisibles from Venezuala and the Thievery Corporation from D.C.
For the past ten years playing in Vancouver (BC) Marc held a weekly residence called CLAVE at the funky tiki lounge, the world famous Waldorf Hotel. Marc currently has two DJ residencies in Vancouver, on Granville Island and at the Calabash Bistro called COCONUT THURSDAYS where he spins a sun-infused soundtrack for after work gatherings. Marc is available to do custom soundtracks for gallery openings, fashion shows, themed parties etc.